St. Patrick’s Day has come and gone, but if you still have some partying left in you, get yourself to the Emerald Isle for an authentic Irish cultural experience. With so many regions worth checking out, Ireland is best explored by car, either driving yourself or, better yet, with a driver-guide. Fly into Dublin in the east or Shannon in the west — preclearing U.S. customs at either airport on the way home — and circumnavigate the island for an enchanting journey through the land of St. Patrick. After another round of snowmaggedon, it seems like the warm weather might never arrive. But you really need to get out of the house and stop freezing, maybe even see solid ground. Fortunately, with these island getaways just a few hours’ nonstop flight from the major airports on the East Coast, you can get yourself to the warmth without too much trouble. Leave in the morning and by afternoon find yourself stretched out a long pink or white beach. Hit the links at one of the island’s many top-flight golf courses. Try your hand at sailing in the waters that were to last year’s America’s Cup races. Fish for all manner of species in the clear waters off the beach, over the reefs or out in the deep sea. Or just get an eyeful of the colorful aquatic life by diving or snorkeling around the more than 350 shipwrecks offshore. Jump on a flight to Nassau and you’ll be soaking up the sun in no time. There you’ll find a treasure trove of nautical and colonial history best explored on a tour of the defensive forts that ring New Providence island and in the Pirates of Nassau museum. Kids of all ages will enjoy the wonders of Aquaventure, Dolphin Cay and marine habitat at Atlantis on Paradise Island. Those of legal age will equally enjoy the gaming at casinos and sportsbooks, as gambling is legal throughout the islands for nonresidents ages 18 and older. Fly into Montego Bay in the north of the island, and you’re right in the middle of an array of great resorts. The northern coast of the island, especially the 120-mile stretch from Oracabessa in the east to Negril on the western tip, is a playground of white-sand beaches, lush forests and rushing rivers. Rafting on the White River or the Martha Brae is a must. Reggae music and the smell of jerk chicken and pork fill the air, while smooth Blue Mountain coffee gets you energized for another day of adventure. Having avoided major damages when Hurricanes Irma and Maria came through last fall, Providenciales and the Grace Bay area are still a top destination for beautiful beaches and turquoise waters. The Columbus National Marine Park off Grand Turk, Salt Cay, and the coral reef right there in Grace Bay are a few of the great dive spots home to all kinds of marine life. If you prefer to keep your head above water, Provo Ponies has morning and afternoon horseback rides along trails and across Long Bay Beach. Jet into Punta Cana and you’ll find yourself just a few hours removed from home but in an oasis of all-inclusive resorts straddling the Atlantic Ocean and Caribbean Sea. While the beaches are great for lounging, activities abound, from ATV rides to horseback riding to day trips to nearby Isla Saona. Work with us to pick the resort that’s right for you and you’ll find a haven of relaxation, entertainment and dining all within easy reach. Chase away the winter blues. Maybe it’ll warm up by the time you get home. So you couldn’t get the whole family on the same page in time to coordinate a trip over the holidays. Instead, you’re even more desperate for a vacation after the constant stream of visiting or welcoming relatives, shuttling back and forth between parties and overloading on holiday cheer. Well, you’re in luck, because January offers an abundance of great travel opportunities with smaller crowds and lower prices than during the busy festive season. Start the new year off right with one of these last-minute getaways. Still haven’t gotten a chance to hit the slopes? There are great deals to be had, such as 20 percent off for stays of five or more nights at Virtuoso-preferred Sonnenalp Hotel in Vail or a seventh night free at Richard Branson’s The Lodge in Verbier, Switzerland. One particularly enchanting itinerary is Alpine Adventures’ South Tyrol ski safari. The seven-night adventure includes four-star lodging in Alta Badia and Val Gardena in Italy’s Dolomite mountains, plus three nights in charming rifugi (mountain inns) as you traverse nearly 750 miles of prepared pistes in 12 ski areas, all on one ski pass. Breakfasts and dinners are included, even at two-Michelin-star restaurants in Alta Badia and Val Gardena to fuel your time on the slopes. There’s no use denying it, it’s cold outside, and that is unpleasant. On a frigid night, many of us dream of jetting off to a tropical island, kicking back with a drink and soaking up the sun’s warmth. To satisfy that craving, head to beautiful St. Lucia, where a whole host of great resorts is waiting with open arms to welcome you in from the cold. Save between 15 and 35 percent at Virtuoso-preferred Cap Maison high above picturesque Smugglers Cove and enjoy a private dinner at Rock Maison, a deck perched above the Caribbean Sea equipped with a “champagne zipline” for delivering drinks with maximum efficiency. You don’t have to stray far to visit some world-class cities chock full of culture. To the north, Quebec City is an undiscovered gem that really sparkles as a winter wonderland. Yes, it’s cold, but the Quebecois have perfected the art of staying warm with outdoor activities galore, including the Carnaval de Quebec, which runs Jan. 26-Feb. 11. With Virtuoso-preferred tour operator Discover Holidays, you can check out North America’s only ice hotel, immerse yourself in First Nations culture and get a taste of French refinement on this side of the Atlantic. Plus, there’s plenty of poutine. For warmer climes, look no further than Mexico City. Swiftly emerging as a foodie paradise (with a great exchange rate), Mexico’s capital is a sprawling metropolis combining Aztec and colonial history with chic modern neighborhoods such as Polanco, Roma and Condesa. There is excellent hiking just outside the city, and the metropolis itself has drastically improved in terms of safety in recent years. Our national parks receive the bulk of their visitors during the summer, when things can get pretty congested. If you’re willing to brave the elements, there are some spectacular wildlife experiences to be had. Yellowstone and Grand Teton in particular yield amazing opportunities, as wolves stalk their prey through the snowy landscape, offering a glimpse of roaming bison and elk. Virtuoso-preferred Natural Habitat Adventures provides wolf and wildlife safaris in the parks, with one itinerary emphasizing photography in the playful winter light. With all the geothermal activity in Yellowstone, it’s quite nice to warm up next to a geyser as you watch the wildlife go by. Sure, the top suite at a hotel is glamorous. But it still has four walls and a ceiling, just like every other room you’ve stayed in, right? Unless you’re watching fish and rays swim by in one of the underwater suites at Atlantis the Palm in Dubai or the Underwater Room at Manta Resort on Tanzania’s Pemba Island, that is. Maybe you have a pretty state-of-the-art aquarium at home and that’s still a little too domestic for you. No worries, there are plenty of unique accommodations that can take you out of your comfort zone while still making you feel warm and cozy. Iceland’s Bubble bills itself as a “5 million star hotel” and is a perfect spot for viewing the Northern Lights. Most bubbles are fully transparent, but privacy is not a problem, as trees separate each from bubble from the next. The hotel doesn’t even tell you where it’s located until you book, so there aren’t a lot of gawkers milling around. The bubbles are temperature controlled and wired for electricity, with bathroom, shower and dining facilities in the service house. In winter, the bubbles make for a personal IMAX theater with the Aurora Borealis playing often. In summer, you can enjoy outdoor activities late into the night and see the last rays of the midnight sun fade away. Virtuoso-preferred destination management company Iceland Encounter can help with the arrangements and help you select which bubble is right for you. Virtuoso-preferred tour operator Remote Lands has a special relationship with Three Camel Lodge in Mongolia, where the guest rooms are 30 yurts, or gers, covered with felt and canvas with wood-burning stoves supplying the warmth. The lodge also utilizes solar and wind energy with an eye toward environmental and cultural sustainability. One of National Geographic’s Unique Lodges of the World, Three Camels is a great base for excavating dinosaur fossils under the tutelage of a paleontologist or camel-trekking through the Gobi Desert. The meals are traditional and served in an over-sized ger, and in the Dino House lounge you can learn Mongolia’s favorite game: shagai (played with the ankle bones of sheep and goats) while enjoying a drink from the Thirsty Camel bar. The mountaintop view overlooking Peru’s Sacred Valley and Urubamba River is one you won’t forget. Especially if you spend the night in a pod hanging over a cliff, gazing up at the stars and down at the heartland of the Inca Empire, experiencing the sort of connection the Incas had with the heavens. Booking your place at Skylodge through Virtuoso-preferred Metropolitan Touring is easy. Getting to your room is more of an adventure. Guests climb about 1,300 feet of Via Ferrata (metal handholds and footholds in the rock face) or do a combination of hiking and ziplining to reach the pods. Once you’re there, a gourmet dinner with wine awaits as your reward. Pods contain a bed and sitting, and, yes, there is a separate bathroom. “The ultimate bush bedrooms,” the treehouses at Virtuoso-preferred Lion Sands private game reserve will bring the sights and sounds of the South African wilds into your living quarters. You arrive at sunset to a gourmet picnic and observe as the diurnal wildlife scampers off to sleep and the nocturnal animals take over. A field guide drops you off and offers a tutorial on what to expect, and remains on call should things go bump in the night. Among the sounds you’re likely to hear are hippos honking, lions roaring, leopards calling and hyenas cackling. With three locations (Chalkley Treehouse in the Sabi Sand, Kingston Treehouse in the Sabi Sand and Tinyeleti Treehouse in Kruger National Park), there are distinct options for couples and families, with a varying range of amenities depending on how much you want to rough it. About 125 miles inside the Arctic Circle stands the small village of Jukkasjärvi, Sweden, once frequented only by the reindeer-herding Sami people and those trading fur with them. Since 1989, though, it has been home to Icehotel. Not all the rooms are made of ice, and the hotel actually recommends that you spend most of your nights in a “warm room.” But the real attraction are the “cold rooms,” which are rebuilt every year once the weather is right. It’s a good idea to spend either your first or last night in a cold room, where temperatures can be as low as 23 degrees Fahrenheit. You’ll need to bring your own long johns, but Icehotel supplies outer clothes and thermal sleeping bags that are warm enough for temperatures between 10-15 degrees below 0 Fahrenheit (it won’t get that cold). Hot lingonberry tea and trips to the sauna are also provided so you can snuggle in. Virtuoso-preferred tour operator 50 Degrees North has activity packages available to fill your days, and Icebar is open until 12 a.m. for a nightcap. Just back from a whirlwind visit to beautiful Punta Cana in the Dominican Republic. Here I visited hotels large and small all along the coast of this very popular resort getaway. In Punta Cana, there is definitely something for everyone, from luxury boutique hotels in gated communities to enormous all-inclusive resorts offering every imaginable amenity, activity and entertainment. 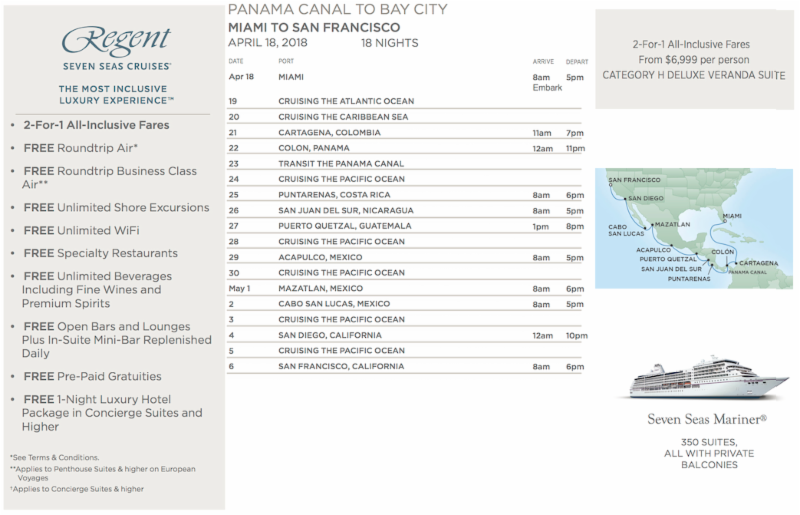 Robert and I invite you to join us on this fantastic voyage from Miami to San Francisco including the fascinating Panama Canal Transit. Along the way you will have the opportunity to visit several UNESCO World Heritage Colonial Cities, beautiful beaches, bubbling volcanoes and more. All the while you will travel on the Ultra luxurious all-veranda suite RSSC Mariner – where everything is included. Travel with us for Exclusive Virtuoso Voyages amenities and $500 per suite on board credit. Amazingly this far ahead, suites are selling fast for this fabulous itinerary.Please contact me for more details and to book your suite.